Offense: It will be interesting to see how head coach Mark Richt and offensive coordinator Thomas Brown handle Miami's quarterback situation entering 2018. Fifth-year senior Malik Rosier is returning, but there are a wide number of people who think the incumbent starter could be replaced. Rosier started off last season strong before struggling mightily down the stretch, completing just 44.9% on the Hurricanes' three-game losing streak to end the year. He also had 14 interceptions over the course of 2017, and needs to show he can control the offense with confidence. If Richt and staff do choose to go in a different direction than Rosier, redshirt freshman N'Kosi Perry is the likely consolation. Perry has impressed coaches with his arm strength and mobility, but is still very raw in the finer points of the game. Four-star newcomer Jarren Williams has also drawn rave reviews, but handing the reigns to a true freshman over senior veteran seems unlikely. 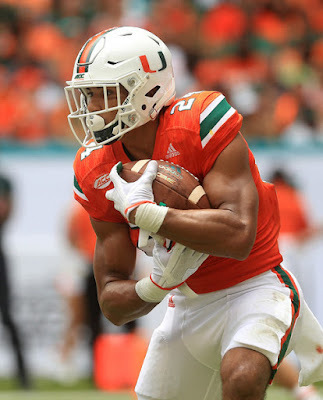 No matter what direction the Hurricanes do go surrounding the QB position, they now they have a strong running back to take some pressure off. Junior Travis Homer took over the reigns for the injured Mark Walton early on and didn't disappoint, finishing with 966 yards and eight touchdowns on the year. True to his name, Homer is a home run threat who can score every time he touches the ball. He also remains a solid receiver out of the backfield, giving this Miami offense a really helpful spark at times. Sophomore DeeJay Dallas made some noise in a backup role last season and could do much the same in 2018, but more people are excited about true frosh Lorenzo Lingard. Lingard is a local star out of Orange City, Florida, and is widely considered one of the top backs in the entire country this 2018 recruiting class. He could immediately get big-time usage as a change-of-pace weapon behind Homer. Receiver also doesn't seem like a huge concern for the Hurricanes, thanks in large part to the healthy return of junior Ahmmon Richards. Richards was an absolute monster in 2016, earning Freshman All-American honors and finishing with the most receiving yards from a freshman ever in UM history. Unfortunately, he had a knee injury late in the year that really killed this Miami offense. Now hopefully 100 percent and a little bit beefed up, this could be a Biletnikoff Award candidate. Junior Lawrence Cager and sophomore Jeff Thomas should be effective supporting characters, with Cager likely to emerge in the red zone, where is size advantage will be the most important. At tight end, the 'Canes bring back Michael Irvin II, who obviously has the lineage to really be a star. But, new freshman Brevin Jordan comes all the way from Las Vegas and has big-time potential. The O-Line could be a concern, although there is some healthy experience returning. Senior left tackle Tyree St. Louis should really be the leader, with another veteran, Tyler Gauthier, locking down the interior. The right side of the unit looks to be a little bit thin, which could come out down the stretch in a long year. Miami's 2017 offense was right around the middle of the pack with in scoring and yards per game, so I envision a spike up entering this season. They should be much more healthy throughout this group, and Richt and staff brought in some really exciting new freshmen. Defense: Miami instantly caught fans' attention with their "Turnover Chain", a flashy piece of jewelry given out to the defender who created a turnover. This defense seemed to feed off that energy, and was a huge reason Miami was +13 in the turnover margin, fifth best in the entire country. It is likely the Chain will make a reappearance in 2018, and likely be broken out quite a bit. Up front, DC Manny Diaz should unleash junior defensive end Joe Jackson, who seems ready to become a star. Jackson led the team in sacks (with 6.5) and played with a constant edge all year long. Sophomore Jonathan Garvin will be coming in from the other side, giving opposing quarterbacks plenty of nightmares. Senior tackle Gerald Willis will be a huge run stopper, likely eager to get back on the field after sitting out last season. The Hurricanes have some serious ups-and-downs leaning on a trio of three current juniors in Michael Pinckey, Shaq Quarterman and Zach McCloud. With plenty of ACC action now under their belt, the three should assert themselves as one of the best linebacker groups in the nation, if they haven't already, considering some of the astounding things they did in '17. Quarterman, the middle linebacker, was pivotal in run defense, with 83 tackles. Pinckney and McCloud focused more on getting after the quarterback and causing chaos in opposing backfields. Its reasonable to be super excited about this trio's ceiling together this year with their talent and comfortability in this system. Diaz and Richt should also feel very comfortable about their secondary, which has some veteran leaders and some interesting young talent. Senior safety Jaquan Johnson is the main force, but senior corner Michael Jackson also plays a huge role. Johnson led the team with 96 tackles last year and added four interceptions, while Jackson consistently took on the best wide outs the ACC had to offer and shut them down. Senior Sheldrick Redwine is also returning after a strong 2017 campaign (59 tackles, six pass deflections), while sophomore Trajan Bandy looks like a budding star. Bandy had 25 tackles and one INT (which he took to the house) as a reserve last year, and should move into a starting role at the corner spot opposite of Jackson. Once again, Miami should play a swarming, aggressive brand of defense under the tutelage of Diaz. The defensive line has proven it can wreak havoc, the linebackers are experienced and versatile and the back-end should be flying all over the place. This should be one of the best defensive teams in the conference, and the D should be a huge reason why Miami proves to be the team to beat in the ACC Coastal. Special Teams: The 'Canes will almost certainly miss the services of kicker Michael Badgley, who graduated after hitting 17 of 23 field goals last season. 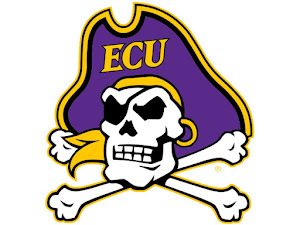 His likely replacement is freshman Bubba Baxa, who has potential, but is obviously unproven at the FBS level. The return game will also sorely miss utility man Braxton Berrios, although Jeff Thomas proved he could make guys miss a year ago. Even though their 10-0 start got slightly overshadowed by a three game skid to end the year, Miami's 2017 was a massive success. The 'Canes won the ACC Coastal, playing in their first ever ACC Championship Game, played in an Orange Bowl, and were one of the most talked about teams in the sport. It won't be an easy act to follow up, but this Hurricanes team has the chance to be even better. There is a ton of depth and experience up and down the two-deep, and playmakers at nearly level. 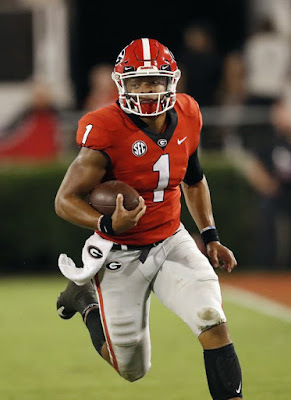 The real X-factor will be QB play; if Rosier can cut down on turnovers and play better down the stretch this team is a legitimate National Title contender. If he doesn't, Miami looks more like a solid, fringe New Year's Six Bowl team. Even so, UM looks like the clear-cut favorite in a Coastal Division that is down this season, and should return to the ACC Championship Game, at the very least.